Imaging Place grows out of an ongoing collaboration with Greg Ulmer and his investigation of what he has referred to as electracy. Electracy describes the kind of literacy or skill and facility necessary to exploit the full communicative potential of new electronic media such as multimedia, hypermedia, social software, and virtual worlds. In his book Internet Invention: From Literacy to Electracy, Ulmer writes, “electracy is to digital media what literacy is to print.” It encompasses the broader cultural, institutional, pedagogical, and ideological implications inherent in the transition our society is undergoing. Imaging Place is an attempt to invent a truly electrate form of artistic expression. Since the project anticipates the possible role that virtuality and network technology might play in memory enhancement and augmentation, I turned to Fredric Jameson’s idea of the cognitive map. A cognitive map is a mental image that we create in order to navigate and negotiate the world and our everyday lives. It is practical, in that it includes directions to work, for instance, go two blocks and turn right… but it is also abstract and metaphorical. All of our formative experiences have a place on the cognitive map. In that respect, a cognitive map is like a spatial representation of our identities. Cognitive maps allow us to reduce cognitive load, enhance recall, learn and remember. The oldest known formal method of using spatial locations to remember is the “method of loci” or “memory palace,” a mnemonic device used by students of rhetoric in ancient Rome to enhance memory. If you imagine a very familiar place, your living room perhaps, and visualize placing what ever it is you need to remember on the coffee table, as if it were an object, when it comes time to recall, it is simply a matter of walking through the living room, in your minds eye, and picking the object up off the table. I took this concept to the next level in the exhibition Mixed Realities at the Huret & Spector Gallery at Emerson College in the spring of 2008. 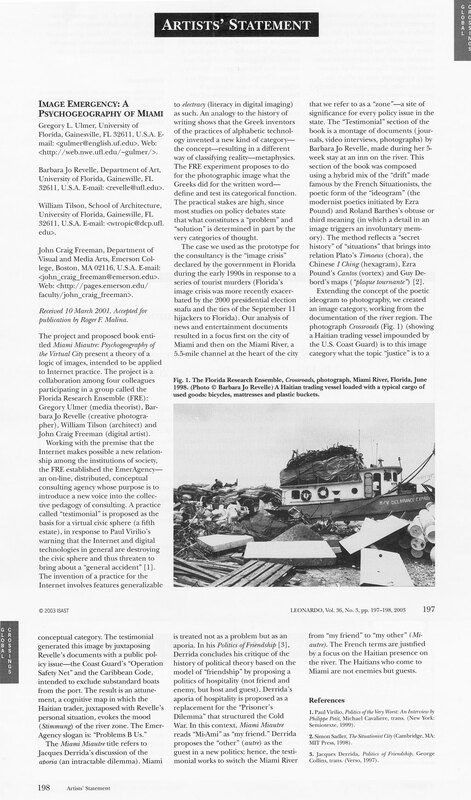 Commission by Turbulence.org, my contribution was Imaging Beijing, which focused on the demolition of traditional neighborhoods of Beijing to make room for the building that was taking place the summer before the 2008 Summer Olympic Games. 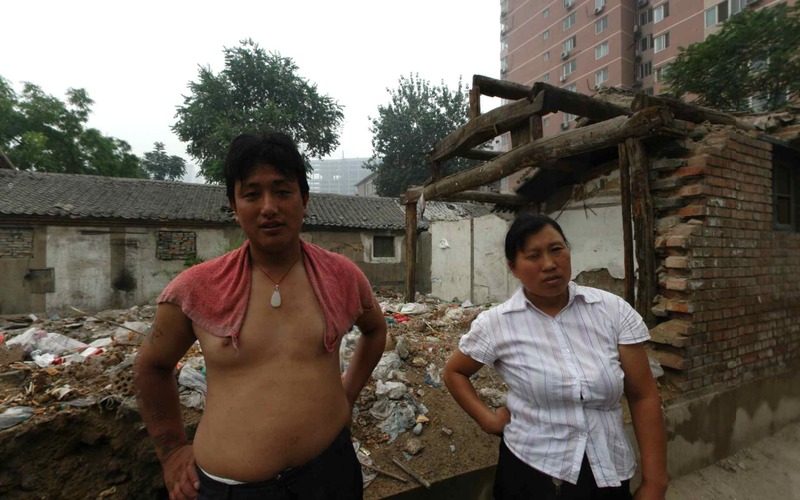 These neighborhoods often referred to as hutongs, have a rich history reaching back hundreds of years. The word hutong comes from the Mongolian word hottog, meaning water well. The center of the traditional community was the well. The word has come to refer to the narrow alleyways used to navigate the complexes made of traditional courtyard residences, which have no frontage other than a simple door in a brick or plaster wall. Moving through these neighborhoods is like negotiating a labyrinth. In the installation, a web-cam captured live video of the user and transmitted it to the head of an avatar, so that other avatars in the virtual space could see and talk to the person navigating the project from within the physical gallery. I was often present in the virtual space, in my avataric form, to guide users through the experience, giving the project a real-time performative component. Opening Reception “Mixed Realities,” interactive mixed reality installation and virtual performance, Ars Virtua, Second Life, 2008. 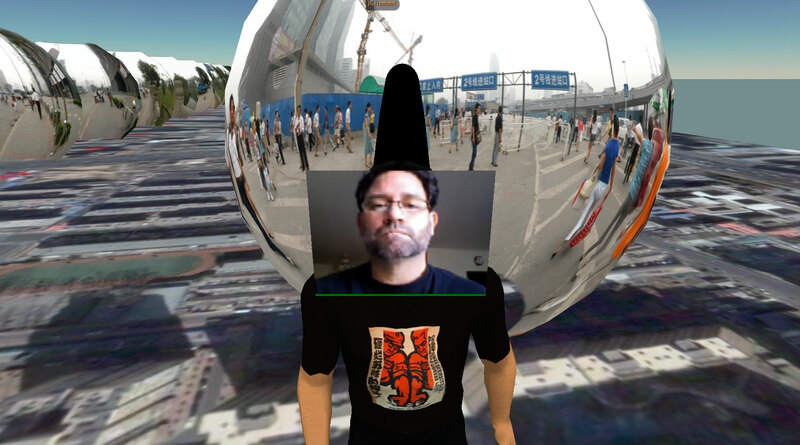 Screenshot of avatar with live webcam, “Imaging Place: Beijing,” by John Craig Freeman, interactive mixed reality installation and virtual performance, “Mixed Realities,” Ars Virtua, Second Life, 2008. 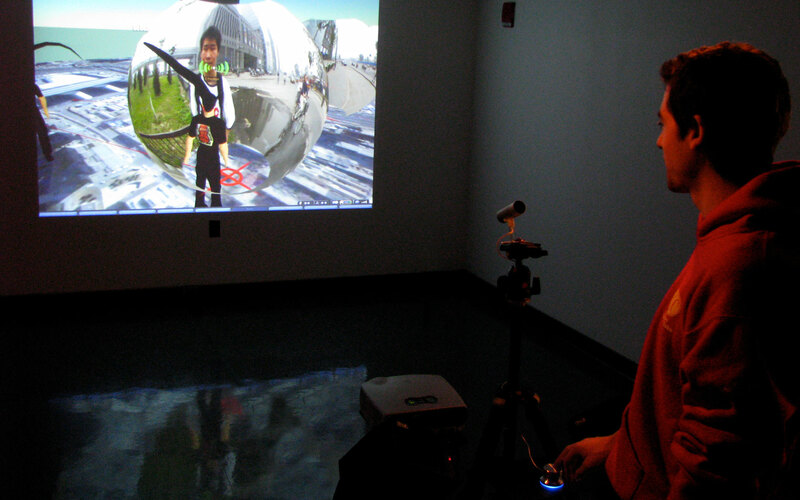 Installation view of “Imaging Place: Beijing,” by John Craig Freeman, interactive mixed reality installation and virtual performance, “Mixed Realities,” Huret & Spector Gallery, Boston, 2008. 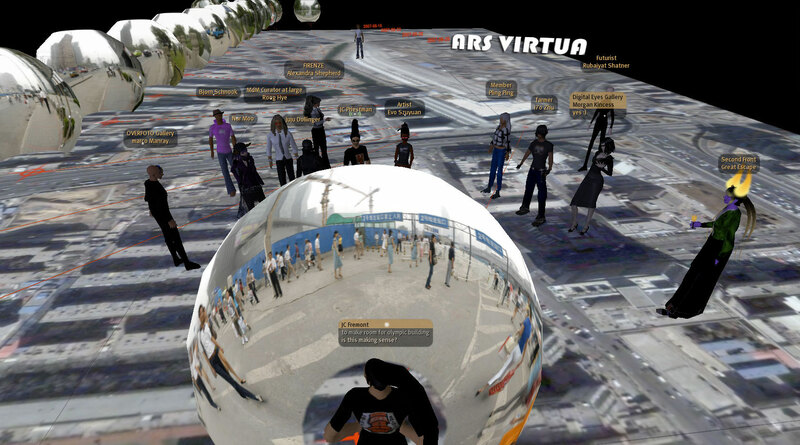 Screenshot view from inside a panoramic node of Xizhimen hutong, “Imaging Place: Beijing,” by John Craig Freeman, interactive mixed reality installation and virtual performance, “Mixed Realities,” Ars Virtua, Second Life, 2008. All previous narrative form is linear. Books, films, even simple stories have a beginning, a middle and an end. This technology makes possible narrative form that is structured over space rather than time. Since the work is spatial instead of linear, people could navigate from the functional hutong; through the demolition zone; passed the construction sites; and into the contemporary Chinese metropolis, in that, or any other order. Marc Prensky coined the term digital native in his article Digital Natives, Digital Immigrants, published in 2001. The optimist in me believes that this generation will one day become bored of the ‘toy’ part of video games. When that day comes, they will still expect to be able to be immersed in, explore, and have adventure and social interaction in, their collective knowledge base. For more, please see Surface Tension Supplement No. 6: Unsitely Aesthetics: Uncertain Practices in Contemporary Art, Maria Miranda, Berlin: Errant Bodies Press, (2013), pp. 174–193.